A Hubble image of galaxy cluster MACS J0717, which contains a huge amount of information about the cluster itself thanks to the light from background galaxies. Image credit: ESA/Hubble, NASA and H. Ebeling. You don’t have to detect a particle to know that dark matter is real. In the 1970s, Vera Rubin’s observations showed galactic rotation was too quick at the outskirts for normal matter alone to explain. Traceable stars, neutral gas, and (even farther out) globular clusters all point to the existence of dark matter, which has mass but exists in a large, diffuse halo well beyond the normal matter’s location. Image credit: Wikimedia Commons user Stefania.deluca. But 40 years prior, Fritz Zwicky observed the motions of individual galaxies within clusters, and found the same effect. 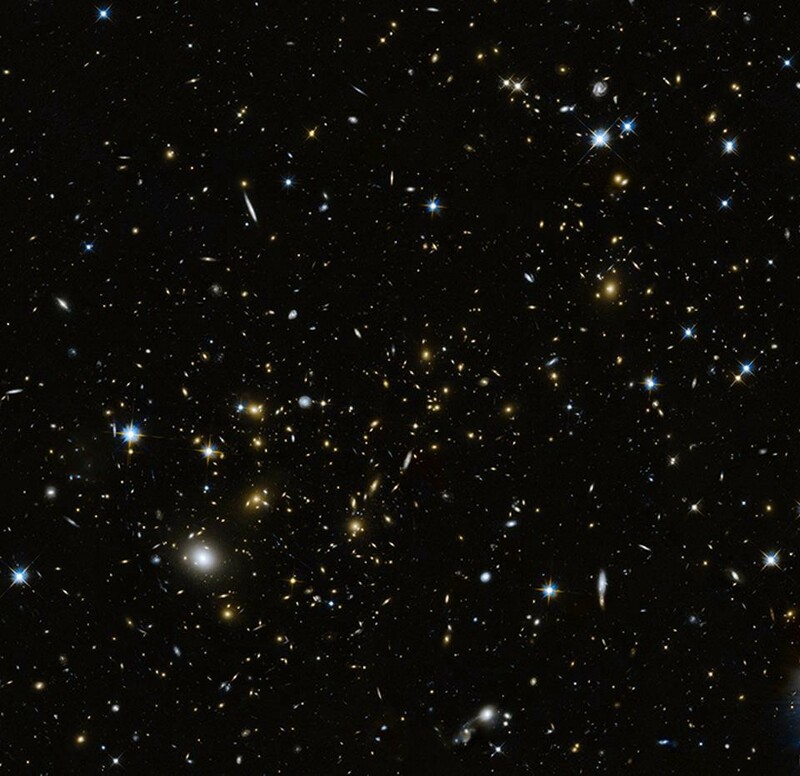 The Coma cluster of galaxies, whose galaxies move far too quickly to be accounted for by gravitation given the mass observed alone. Image credit: KuriousG of Wikimedia Commons, under a c.c.a.-s.a.-4.0 license. Even as we’ve learned to observe gas, dust, plasma, failed stars and planets, normal matter only explains 15% of the gravitational signal we see. This image illustrates a gravitational lensing effect due to the distortion of space by mass. Image credit: NASA, ESA, and Johan Richard (Caltech, USA); Acknowledgements: Davide de Martin & James Long (ESA/Hubble). The key to understanding gravitational observations arises from gravitational lensing, where mass bends the background starlight. Six examples of the strong gravitational lenses the Hubble Space Telescope discovered and imaged. Image credit: NASA, ESA, C. Faure (Zentrum für Astronomie, University of Heidelberg) and J.P. Kneib (Laboratoire d’Astrophysique de Marseille). Under serendipitous configurations, background galaxies are deformed into arcs and multiple, distorted images. The galaxy cluster Abell 68, and its many lensed and distorted background galaxies. Image credit: NASA & ESA. Acknowledgement: N. Rose. This phenomenon — strong lensing — allows us to determine the total cluster mass. Any configuration of background points of light — stars, galaxies or clusters — will be distorted due to the effects of foreground mass via weak gravitational lensing. Even with random shape noise, the signature is unmistakeable. Image credit: Wikimedia Commons user TallJimbo. Even without optimal configurations, weak gravitational lensing causes a well-defined distortion in the shape of background galaxies. The galaxy cluster SDSS J1004+4112 severely distorts the light from background galaxies, allowing us to measure its mass. Image credit: ESA, NASA, K. Sharon (Tel Aviv University) and E. Ofek (Caltech). With numerous enough galaxy counts — obtainable anywhere with deep telescope observations — the total mass of any galaxy cluster can be reconstructed. The overlay in the lower left hand corner represents the distortion of background images due to gravitational lensing expected from the dark matter “haloes” of the foreground galaxies, indicated by red ellipses. The blue polarization “sticks” indicate the distortion. Image credit: Mike Hudson, of shear and weak lensing in the Hubble Deep field. His research page is at http://mhvm.uwaterloo.ca/. Consistently, about five times too much mass is needed compared to the existing normal matter. Four colliding galaxy clusters, showing the separation between X-rays (pink) and gravitation (blue), indicative of dark matter. Images credit: X-ray: NASA/CXC/UVic./A.Mahdavi et al. Optical/Lensing: CFHT/UVic./A. Mahdavi et al. (top left); X-ray: NASA/CXC/UCDavis/W.Dawson et al. ; Optical: NASA/ STScI/UCDavis/ W.Dawson et al. (top right); ESA/XMM-Newton/F. Gastaldello (INAF/ IASF, Milano, Italy)/CFHTLS (bottom left); X-ray: NASA, ESA, CXC, M. Bradac (University of California, Santa Barbara), and S. Allen (Stanford University) (bottom right). Moreover, when galaxy clusters collide, mass reconstruction from weak lensing shows an inescapable separation from normal matter. No alternative gravity theory explains all this. We need dark matter. On the largest scales, the way galaxies cluster together observationally (blue and purple) cannot be matched by simulations (red) unless dark matter is included. Image credit: Gerard Lemson & the Virgo Consortium, with data from SDSS, 2dFGRS and the Millennium Simulation, via http://www.mpa-garching.mpg.de/millennium/.